February 26. 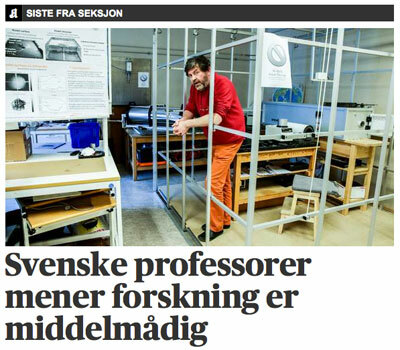 "Swedish professors think that the science [in Norway] is mediocre," reads the headline in today's Aftenposten. And here is Trond Torsvik inside the magnetic shield at our own Ivar Giæver Geomagnetic Laboratory at the UiO. How dare they! The article discusses why the Norwegian science is not doing as well as it could have been doing, featuring an interview with Trond, who gave his thoughts and opinions on why this is happening and what can be done to improve the situation. The full text can be found here (in Norwegian bokmål). December 16. 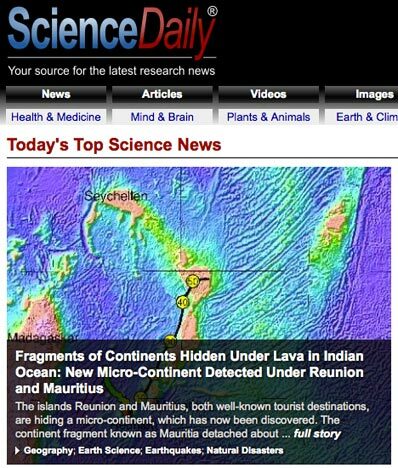 Our discovery of the lost (micro)continent Mauritia in the Indian Ocean (see the post of February 25 below) made it to the Nature Readers' Choice of 2013: The 10 most-read news stories of the year. Congratulations to Trond Torsvik, Carmen Gaina, Pavel Doubrovine, Bernhard Steinberger and their coauthors! This story was also featured in an interview given by Trond Torsvik to Uniforum, a weekly newspaper published by the University of Oslo. You can read the entire article (unfortunately only in Norwegian, nynorsk) here. May 24. Abigail Bull-Aller gave an interview to Apollon (a popular science magazine published by the University of Oslo), in which she talks about her work on modeling mantle convection. Read the full article. 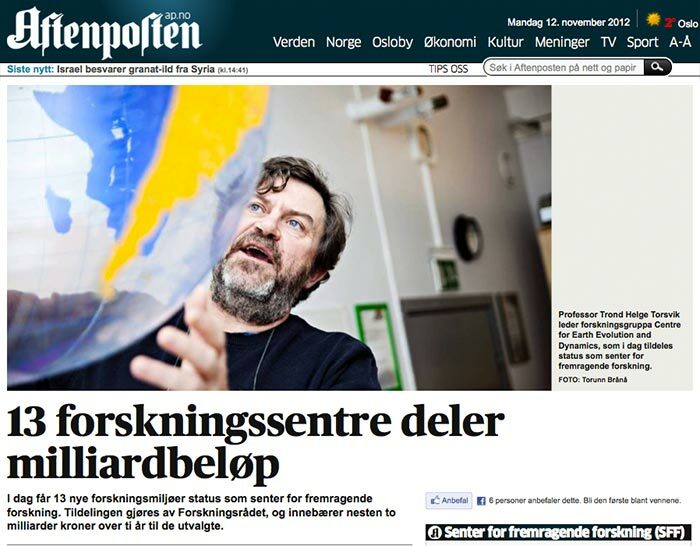 The interview was also covered by Aftenposten; you can read the article here. April 5. 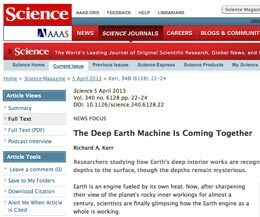 A News Focus article covering recent developments and ongoing research in relating the surface motion of tectonic plates to the dynamics of thermally-driven convection within the Earth's mantle was published in the today issue of Science (The deep Earth machine coming together, Science, v. 306, no. 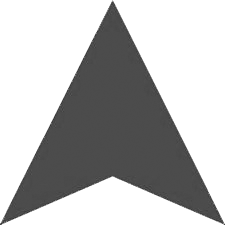 6128, pp. 22-24, doi:10.1126/science.340.6128.22). We are pleased to see that the article discusses the results of Trond Torsvik, Bernhard Steinberger and their coworkers (Torsvik et al., 2010) as a key evidence for the connection between mantle plumes and Large Low Shear-wave Velocity Provinces at the lowermost mantle. March 15. 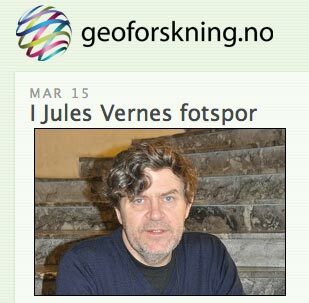 An interview with Trond Torsvik with the eloquent title "In the footsteps of Jules Verne" (I Jules Vernes fotspor) was published at the Norwegian web portal for Earth Sciences Geoforsking.no. In this interview Trond talks about the Centre for Earth Evolution and Dynamics (CEED), the motivation for creating it, challenges he had to meet to make it happen, his scientific career, ambitions, achievements, setbacks, research plans and perspectives for the future. Listen to the radio broadcast from BBC World Service - BBC News here (starts 4:30 into the news). 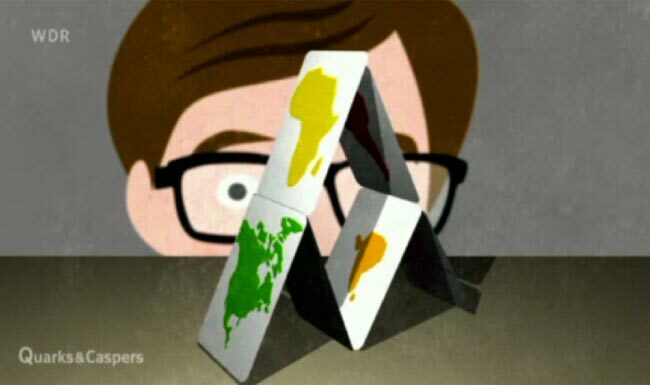 And here you can listen to the radio broadcast from ABC News (Australia) including interviews of Richard Arculus (who reviewed the study) and Trond Torsvik. February 18. In an interview to Uniforum, a weekly newspaper published by the University of Oslo, Trond Torsvik talks about the origin of large igneous provinces (LIPs) and catastrophic volcanic eruptions. Read the article here (nynorsk). January 14. Endelig! Now kids know where to look for diamonds! 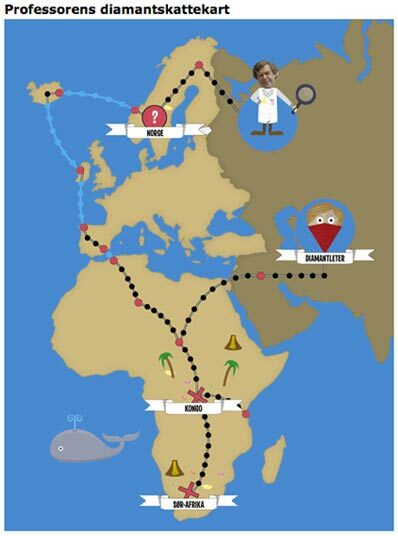 A secret treasure map (on the right) was released after an interview given by Trond Torsvik to Nysgjerrigper, an on-line popular science magazine for children published by the Reserach Council of Norway. Among other amusing things, Prof. Torsvik told to the magazine that diamonds could be certainly found in Norway, just "nobody really cared to look for them thoroughly." This will undoubtedly spark a diamond rush among young Norwegian prospectors. 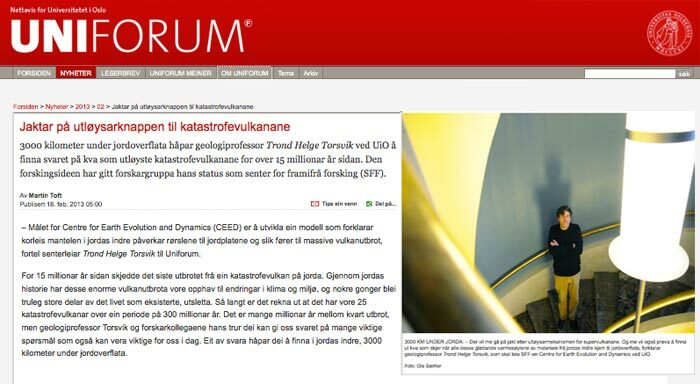 Read the full article here (bokmål). Disclaimer: Prof. Torsvik has never been seen wearing a white lab coat, and rarely uses a magnifying glass. December 18. 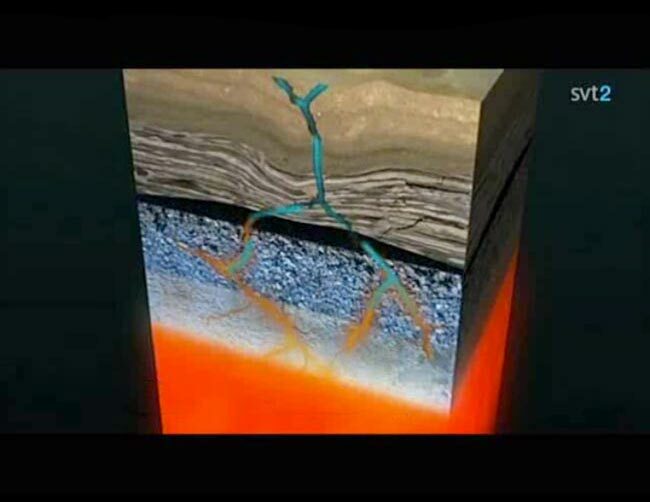 Inspired by our paper published earlier this year by in the Journal of Geophysical Research, Quarks & Caspers, a German popular TV program for kids running on WDR Fernsehen, aired a segment featuring an animation of plate motions and true polar wander contributed by Pavel Doubrovine, Bernhard Steinberger and Trond Torsvik. 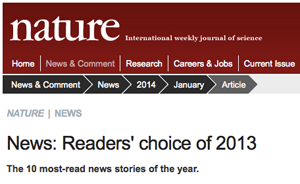 According to the program's rating, our TPW story was voted number 3 of the top scientific discoveries of 2012. Note that some parts of the broadcast (e.g., burning a finger on the Hawaiian hotspot, or flying on a magic carper) are purely fictional. The full podcast of the program can be downloaded here. November 13. More coverage of the new Centre for Earth Evolution and Dynamics. This time at a Norwegian popular web portal for Earth science (geoforsking.no). November 12. Trond Torsvik gave an interview to Aftenposten, in which he talks about new perspectives on research in plate tectonics and mantle dynamics at the Centre for Earth Evolution and Dynamics (CEED), a brand new Norwegian Centre of Excellence at the University of Oslo that has been awarded to him and his team by the Norwegian Research Council. October 8. Two popular articles on true polar wander (TPW) appeared last week in Der Spiegel and Discovery News (also at EarthSky.org). The articles were inspired by the new estimates of TPW presented in the paper of Pavel Doubrovine, Bernhard Steinberger and Trond Torsvik "Absolute plate motions in a reference frame defined by moving hotspots in the Pacific, Atlantic and Indian oceans," which was published earlier this fall in the Journal of Geophysical Research. 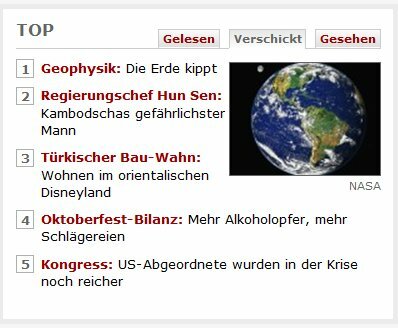 Remarkably, the article in Der Spiegel (Die Erde kippt, see the image to the right) beat a story on Oktoberfest drunkenness in their top list; this is something that we are particularly proud of. September 16. A recent paper by Pavel Doubrovine, Bernhard Steinberger and Trond Torsvik receives an Editor's Highlight from the Journal of Geophysical Research published by the American Geophysical Union. On September 11, Trond Torsvik, a laureate of the André Dumont medal awarded by the Geological Society of Belgium, presented the keynote lecture "From Wegener until now" at the 4th International Geologica Belgica Meeting in Brussels. An abstract of his presentation can be found here, and a PDF copy of his slides can be downloaded here. Holly Stein and Judy Hannah appeared in an episode of Vetenskapens värld, a Swedish popular science program that runs on the SVT2 TV channel. The program was broadcasted in April and August 2012. Synopsis: Holly Stein and Judith Hannah became interested in the 75-km-diameter Siljan structure as a natural locality to assess fractionation of Re and Os between source rock and oil during the maturation process. The Early Paleozoic succession in central Sweden features Late Ordovician black shales and intervening carbonate mounds – that is, source and reservoir rocks side-by-side. With instantaneous heating (maturation) on impact of the Siljan bolide in the Late Devonian, oil was created and moved from shales into adjacent carbonate reservoir reef rocks. Live oil still seeps from quarry exposures today in the Siljan region. After garnering industry support for the project, Stein and Hannah and their team worked to extract the strong Os isotopic signal delivered to the oil by the meteorite from the Os isotopic record inherent to the oil and linked to anoxic seawater conditions during Late Ordovician shale deposition. More information on Re-OS dating of hydrocarbons is available at the AIRIE Program website. 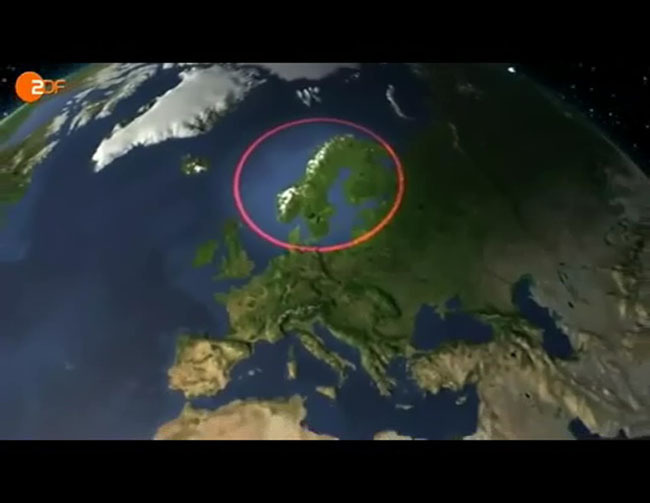 To celebrate the 100th anniversary of the publication of Wegener's book on Continental Drift, Der Spiegel published an animated simulation of plate motion of the last 150 million years, based on work by Bernhard Steinberger and Trond Torsvik. We contributed to an animation of plate movements for a German TV show on Scandinavian geology and geography, called Faszination Erde. Our contribution starts after 14.45 minutes… and lasts for about 5 seconds! Our Gplates output obviously went through a graphics persons hands. The overview of this broadcast can be found here. See below for our little snippet. An article by Torgeir Andersen, "Atløy, et geologisk skattkammer i Sunnfjord," was published in Geo, which is a popular science magazine of the Norwegian Geological Society (Andersen, T. B., 2011, Geo 5 (6): 43-43). The article presents a semi-popular version of the geology and geological history displayed in a very small and therefore unique area of Atløy Island in the western Norway, which Torgeir passionately terms "et geologisk skattkammer," a geological chamber of treasure.